In the interests of full disclosure, I will say right up front that we didn’t have to pay for the unit, and we were provided with a small “trial size” data plan from Winegard to test the cell service side of the unit. There was no other compensation for this review. We were contacted a while back by Winegard and asked to review one of their products, the ConnecT 2 WiFi and Cellular combo. I was happy to do it, because internet connectivity is a BIG deal to us, and to a lot of full timers. Before I get into the review, I wanted to give you some background info so it all makes sense. People have a wide variety of knowledge on this topic, but I want to make the review as useful as possible to as many people as possible, so I thought I would explain some of the tech stuff for those who need more information. If you consider yourself well versed, skip down to the review itself. Essentially, the ConnecT 2 uses either a cellular modem or a WiFi extender to connect to the internet, and then it creates a WiFi network inside your rig so you can use that connection. Keep in mind that with this specific product, we’re talking about two different methods of connecting to the internet; WiFi and cellular. There are several products available for either one of these, but not many that do both. Some people use cellular boosters; anything from a simple cradle type booster that your phone sits in, to a high gain exterior antenna that goes on the roof, or at the top of a flagpole or other mast. These boosters are not terribly complicated. They basically just amplify an existing weak cell signal so you can use it for voice or data. If there’s no signal at all, they do not help. You can’t boost something that isn’t there to begin with. The primary benefit of having an exterior antenna at the top of a pole is that there is often a very weak signal available much higher than the roof of your rig that it will boost, but nothing to boost down at ground level. Again, it’s important to remember that there has to be something there to work with. Zero signal can’t be boosted. The Winegard ConnecT 2 is not a booster. It is a cellular modem, similar to a Jetpack or other type of cellular internet connection. The advantage it has over most of those is that the modem and antenna are on the roof, so the added height and the lack of the walls of the RV allow you to potentially connect to a cell signal that might be otherwise too weak. The WiFi side can be more complicated. To begin with, campgrounds or other locations that offer WiFi are generally buying some level of internet connection from a provider. They will have a company install routers and antennas and repeaters and set up a WiFi network to offer that internet connection to their campground guests. No matter how good or fast the connection they are buying is, by the time you add all that hardware, and then share it with twenty or more guests, your experience is probably going to be less than you want it to be. The network design might be sub-standard in that it’s difficult or impossible to even sign in to it, or the speed to each user might be throttled, or the original service might be low quality, or the hardware might be less than optimum for the design. In short, free WiFi (and even some paid WiFi) is generally not great, and no amount of boosting is going to improve that. A WiFi booster at best simply allows you to connect to a network that might be just out of reach, or completely out of reach of the antenna in your laptop or other device. A booster isn’t going to improve the network or the service the provider is providing. A WiFi extender only lets you reach a little farther to connect than you would otherwise be able to. In both cases, the Winegard ConnecT 2 allows you to “reach” farther. If a campground offers WiFi, and you can connect to it “at the office” but not from your rig, a booster might allow you to extend that reach to your rig. If you can get a cell signal, but it’s so weak that your connection keeps getting interrupted, a booster might make that more stable so you can at least surf the web, look at Facebook, etc. So before you buy anything at all, make sure you understand what the limits of the technology are. None of this is intended to discourage you from buying a cell or WiFi or combo booster, just to let you know that they’re not magical. One other thing to remember is apart from email and internet, a lot of people use the internet (cellular or WiFi) for entertainment. Services like Netflix and Amazon prime allow you to stream movies and TV shows, and LOTS of people we’ve talked to over the years don’t have great experience with that. Streaming can also be used for real time video “phone calls” and using “voice over internet” phone calls. The main problem is that streaming requires a more robust and stable connection than downloading. With streaming, you are transferring the data that makes up the picture and sound as you watch it in real time, sort of like drinking out of a faucet. As opposed to downloading, where you transfer all of the content at once, and then watch it later, whether you are connected to the internet or not. More like filling a bottle with water and then drinking it another place and time. So keep in mind that HOW you use your connection, along with the quality of the connection will have an impact on your experience. And finally, be aware that streaming, generally speaking, uses twice to four times more data than downloading. If you don’t have an unlimited plan like we do, that can really eat into your data plan, and fast. We generally burn through around 500 GB of data per month. Since we hit the road, we’ve been using a little AT&T Velocity. It’s a dedicated cellular modem about the size of a deck of cards that uses a cell signal to create a WiFi network that multiple devices can use to connect to the internet. Even though it’s over 4 years old, the radio in it is pretty decent, and we almost always have enough signal to download movies and TV shows. Sometimes we can download a one hour show in 5 minutes, if we have a blazing fast connection, and sometimes it takes overnight to download the same show if we’re just getting a “trickle”. But there have been a fair amount of places we’ve stayed (sometimes for months at a time) where we need to use our cell booster to get any signal at all. 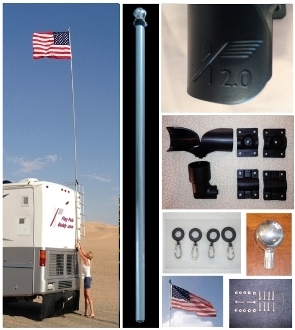 For that, we’ve been using a WeBoost exterior antenna on a 22′ telescoping Flagpole Buddy. It was a decent solution when we bought it four years ago, but it ONLY boosts cell signal, and it’s very expensive. The unit was around $400, and the flagpole buddy was around $150. That particular WeBoost product has been discontinued, but they do have other similar comparable products available now. The thing we’ve never liked it about it was that it had to be “deployed” to even see if it would get us a signal, and it’s directional. That mean it has to be pointed at a cell tower, which can be hard to do, and the interior antenna that is uses to broadcast the boosted signal has to be pointed in a particular direction relative to the exterior antenna. Also if the interior antenna and the exterior antenna aren’t a certain distance from each other it “locks up”. Big pain. If we are in a place for a long period of time it was OK to use, but for short periods it often wasn’t worth the hassle. 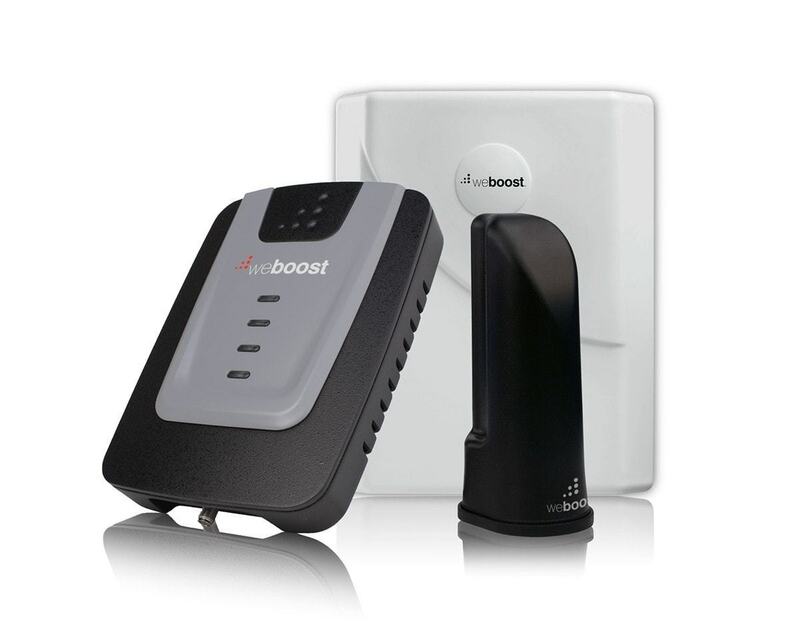 This is the WeBoost kit we have, newer models are more or less the same. I’m a big fan of the Flag Pole buddy, because it’s lightweight, collapses to a very short package, and is easy to set up and take down. Plus, it holds flags! For WiFi, we haven’t ever purchased a WiFi booster because we’re generally not in a place where there is a WiFi signal to boost. I’ve not found a permanently mounted solution at a low enough price to justify getting one. To give you an idea of how bad most campground WiFi is, back when we were on a limited data plan, whenever we were in a campground we would almost always end up just using our Velocity instead of the free campground WiFi. It was that bad. So now we come to the Wingard ConnecT 2, specifically the model that does both cell and WiFi. (They offer a WiFi only and a cell only model, as well). To start with, I’m going to talk about the things I was intrigued by when they contacted us. This particular model is a cell/WiFi combo, which is one of the things that attracted me to it. I like the idea of having both. We’ve been toying with the idea of getting a WiFi booster/extender because sometimes our summer job has WiFi in the office, but usually it is just out of reach. That was our situation last summer. The ConnecT 2 is also designed to be permanently installed, which is a plus for me because I don’t like setting up the flagpole and going through all that hassle of putting the exterior antenna up just to find out that there’s no cell signal there to boost. (It doesn’t have to be permanently installed, however, more on that later.) So given that I was already sort of “in the market” for a better cell solution, and some kind of a WiFi booster, I approached this from the mindset of a customer. Every part of my experience with this unit has been with the thought of whether or not I would recommend it to a friend and whether I would buy one myself. Spoiler alert, I would recommend it to a friend, and if I had bought it, I would keep it, but there’s a caveat to that later. If that’s all you needed, you can stop reading, and go buy one if you want to. The first positive thing I can say about this unit is that it’s really very simple. It consists of a black plastic dome that is 8″ high and 16″ in diameter. To start with, make sure you have room on your roof. Inside the dome are two 4G LTE cell antennas and three WiFi antennas. It’s powered by 12v DC, so you either need to know what you’re doing (holes in the roof!) or have a professional install it. It also comes with a power switch you can install, which I highly recommend, if for no other reason that resetting the unit requires power to be interrupted. For those who boondock, it only uses 1 amp of DC power, but you can always turn it off to conserve power. For my initial testing I did NOT install the unit, I just put it on the roof and then ran the cable down the side of my RV and attached it to a battery. 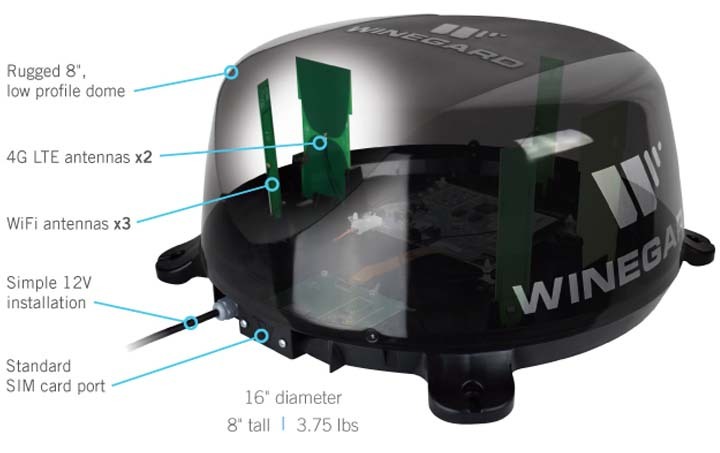 If you don’t want to install it, you can certainly do this, but if it’s going to be on the roof for any length of time, I would be concerned about wind blowing it off because it only weighs 3.75 lbs! After using it for a while and deciding I wanted to keep it, and at that point I did a permanent install. The down side to the roof location is you have to go up there to swap SIM cards, and the LED status light is on the unit itself. On the other hand, the power switch in the rig can be used to restore the unit to factory defaults, so that’s a nice feature. The dome is actually opaque, but in this image you can see what’s inside. If you are going to install it, be aware that you do need to put a few small holes in your roof to mount it, and while that’s always a little scary, if you seal around it properly this is no more dangerous than any of the other things mounted to your roof. The dome is low profile at only 8″, so shouldn’t add to your rig height. Another thing to keep in mind is that in order for it to work as well as it can, it needs to be 12″ from other things on the roof to avoid blocking signals. For those with solar panels, if your roof is crowded, this could be a challenge. Also, installation requires the power cable go through the roof, so you can either create a new hole, or run it through an existing one. If you’re not comfortable doing this installation you can have a dealer, service center, or mobile tech do it for you. It’s best if it’s not “in the shadow” of an AC unit, which could block a weak signal. Another positive thing about this unit is the instruction manual is very well written. The setup process is not difficult, but the instructions need to be followed carefully, and step by step. Luckily, the instructions are very clear, and it’s unlikely you will encounter any trouble getting started. Almost all of the problems I encountered were because I didn’t follow the instructions carefully. Connecting to the unit is more or less the same as connecting to any other WiFi network. If you’ve done that before, this is no different. Essentially the unit creates a WiFi network inside your rig that you connect to, and the connection to the internet is either going to be cellular, through their plan or yours, or to another WiFi network. That part can be a bit confusing, because if you’re using it to connect to a WiFi network, essentially you’re connecting your computer or laptop or phone to the Winegard’s network, and then connecting the Winegard to an outside network. Just follow the instructions. The unit uses a 2.4 Ghz radio, which is slower than other WiFi radios that are available, but has a much longer range. Since the idea here is to give you maximum “reach” I understand that limitation, and accept the trade-off between range and speed. The interface shows you the strength of WiFi and cell signals measured in percentage, and anything under 50% will give you a less than ideal experience. That doesn’t mean you can’t use it, it just will be slower than you want, and perhaps the signal will drop from time to time. I really like being able to see the strength of a signal represented in numbers so I know what to expect. While the unit connects, it will appear as though something is wrong, and it will actually disconnect your device from the unit’s WiFi, but it will reconnect after a minute, and you will be online. I consider this a “con” because I went through this process about 10 times and kept restarting it because when it “kicked” me off the unit’s WiFi I thought something was wrong. This is normal operation, however, and Winegard has already added some minor changes to the interface to let users know what’s happening which is helpful for those of us who are impatient. So let’s talk about performance. One of the reasons we have waited months to write this review is we wanted to test it in more than one place. I was able to test it in two very different locations, the Mt. Hood area in Oregon, and north of San Antonio, in Texas, and my experience was nearly identical in both places. My testing environment in Oregon was very similar to a campground. There is a very weak AT&T signal, just one bar on our Velocity hotspot. Using the Velocity hotspot we were typically getting 10mb downloads speed, but it was very unstable and unreliable, and would cut in and out routinely. Any rain at all would knock that signal back even further. On weekends, when the lake was extremely crowded with campers, the cell tower overloaded, and speeds would be affected, but that’s normal. There was also an office about 150 feet away with a WiFi network shared by those of us who worked there. From inside the rig, our smartphones, laptops, iPads, PC and laptops could NOT see the WiFi network at all. I did speed tests using two servers, both of which I tested on all of my cellular capable devices to ensure I was getting consistent repeatable results I trusted enough to report. All of the tests were done on a weekday morning between 8am and 10am, on a clear day so weather would not be a factor. Using our AT&T Velocity hotspot (not using the Winegard unit at all) , I got inconsistent download speeds of between 2 Mbps and 35 Mbps. That’s a huge fluctuation. Connecting the Winegard unit to the AT&T Velocity, in other words, using the Winegard’s WiFi feature, I got inconsistent download speeds of between 2 and 15 Mbps. Using the Winegard unit with their trial cellular data plan, I got a consistent download speed of 7 Mbs. Using an AT&T sim card in the Winegard using our AT&T data plan, I got a consistent download speed of 7 Mbs. In Texas, the speeds were different, but the comparison was more or less the same. Using our AT&T Velocity hotspot (not using the Winegard unit at all) , I got inconsistent download speeds of between 2 Mbps and 35 Mbps. This is the highest speed I got with the AT&T Velocity., but it was not consistently this fast. Connecting the Winegard unit to the AT&T Velocity, in other words, using the Winegard’s WiFi feature, I got a consistent download speed of between 2 and 15 Mbps. The speeds using the Winegard WiFi to connect to the Velocity’s network were still pretty fast, but not as fast as just using the Velocity directly. The speed I got using the Winegard’s cellular modem and an AT&T sim card were rock solid, and I tested over 20 times, using various servers. And finally, I downloaded a 1GB file to test the “real world” application and with the Velocity the file took 6 minutes to download, and the Winegard took 24 minutes. It’s pretty clear that the Winegard’s cellular modem is not as fast as my 4 year old Velocity. But, that’s not all that matters. When we’re on the edge of a usable signal, we often get very slow, unstable or no performance from the Velocity, which is incredibly frustrating. It sits inside the rig, so it doesn’t have the height and advantage of being outside, up high. What I’ve personally decided is to keep and use both. If we are someplace with a really good solid fast connection, we’ll use the Velocity, but if the signal is weak I think I will be glad to have the Winegard. The reason I said earlier that I would recommend it is because of that fact. There are lots of times we have a weak enough signal that the Velocity is just useless, and this gives me another option. I like the redundancy. Over time I will be able to see how it performs more scenarios, and will likely post again about those details as they occur. I also want to see what it looks like when we’re traveling and get a feel for how the WiFi aspect works with locations that offer WiFi, so I’ll keep everyone updated on that as well. We rarely are able to take advantage of free Wifi, and it would be nice to be able to do so. Update February 2019 – We are no longer using this product. We have tried it in a variety of settings and it has never worked better than our AT&T Wi-Fi box. It costs us an additional $30 a month for the sim card, which we would have paid if we found it useful. The signal strength is incredibly weak (by our standards) regardless of our location and is not usable for the types of internet usage we commonly do. Unfortunately we can no longer recommend purchasing it.